When the Dovahkiin becomes powerful, combat music plays more and more rarely, especially above the level 50. With this little fix mod, battle music always plays when an enemy threatens you, as at the beginning of the game. Why I made this Mod? Until the day when even the bosses (as a Bandit Chief) were affected by the absence of the combat music. Finally, above the level 55, only the Dragons launched their special epic themes! Without combat themes, battles seemed dull... Never hearing Tooth and Claw, Steel on Steel, Caught off Guard, Blood and Steel or Death or Sovngarde... I no longer had desire to fight. So, I decided to solve this problem by myself! First, I found the Combat Music Fix by OmEgA , but it doesn't work for me. Then, I came across this second mod : No Combat Music by Phitt. Of course, it has the opposing effect to the one I want, but he helped me to find the solution. By googling on Fallout forums, I discovered there is one variable that causes the start of the battle music: fCombatMusicPlayerTargetedThreatRatio. This value is reduced at 0 on No Combat Music Mod. By default, this value is 1 in the Vanilla game. 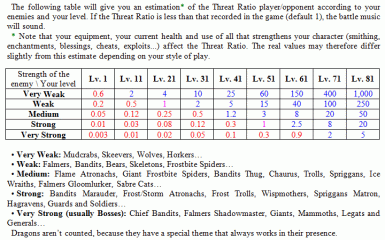 To see if the battle music should be played, Skyrim compares this value to ThreatRatio player/ most dangerous enemy. The ThreatRatio can be known with the code: player.GetThreatRatio [enemy RefID]. 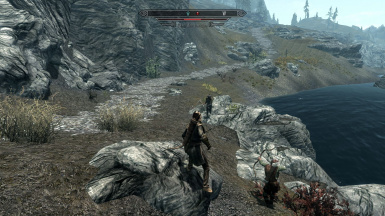 When the ratio exceeds 1 (ie the player is more threatening than his opponent in the eyes of Skyrim), the game considers that the battle music does not happen to be played. But when it goes below 1, the battle music starts immediately. This ratio decreases when the player loses health, removes his armor or his weapons. This explains why some have heard the beginning of combat music when they removed their equipment. To resolve my problem of combat music, I simply set the fCombatMusicPlayerTargetedThreatRatio value at 1000 on a little *.esp file. Thus, the battle music always will engage when an enemy threatens you, even if you are level 81. Today I will share with you this little mod will help you to regain the immersion on Skyrim's battles at high levels. I notice my mod is designed to always hear the combat music during battles. if you never want to hear the combat music, download the Phitt's mod. It's work fine. The version 1.1 allows you to choose a ThreatRatio among the following values: 1000 (main file), 500, 200, 100, 50, 20, 10, 5 and 2. The lower will be the modded ratio; the stronger will be enemies to the battle music starts. 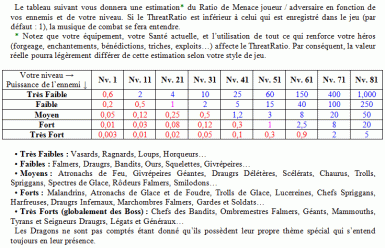 To help you to choose your *.esp, see the table of estimated ThreatRatios in the attached picture. • Phitt for his mod that has guided me on the right path.